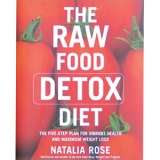 For the NON Raw FOODIES or people wanting to slowly trade off cooked foods.Dr Oz actually was promoting the raw food Eating on his Thursday January 7th 2010 show!!! Transition During the first week, you’ll detox off red meat, eliminate sugars and white flours and start eating your vegetables raw. Instead of white pastas, eat whole wheat, substitute grilled chicken for red meat, swap out sugary desserts for fruits and replace cooked vegetables with raw ones. week you’ll eliminate meat, poultry, eggs and dairy; to compensate, add lots of vegetables and fruit smoothies to supplement nutrients. Try interesting combinations of fruits and vegetables like a banana spinach smoothie – high in potassium, folate, vitamins K and A, and magnesium. During the third week of your detox, add nuts and seeds as a staple of your diet. You can substitute some dairy items with those derived from nuts, like raw almond milk. When snacking on nuts, soak them in water first to wake up their natural enzymes. An excellent lunch on the go is a raw veggie burger made with almonds and walnuts. Even though during week 1 you substituted white pasta with whole grain pasta, you’re now cutting out pasta altogether because it’s cooked. Try a meal consisting of shredded zucchini with veggie meatballs and raw tomato sauce. This may be the most challenging week, as you will be eating 100% raw. I AM ALREADY raw so I don't have white nor wheat pasta.I use zucchini noodles.THIS WAS FROM THE dr Oz site.Dr Oz promoting the raw diet.How cool is that.